FREMONT, Calif., August 31, 2011 – Solyndra LLC, the American manufacturer of innovative cylindrical solar systems for commercial rooftops today announced that global economic and solar industry market conditions have forced the Company to suspend its manufacturing operations. Solyndra intends to file a petition for relief under Chapter 11 of the U.S. Bankruptcy Code while it evaluates options, including a sale of the business and licensing of its advanced CIGS technology and manufacturing expertise. As a result of the suspension of operations approximately 1,100 full-time and temporary employees are being laid off effective immediately. Despite strong growth in the first half of 2011 and traction in North America with a number of orders for very large commercial rooftops, Solyndra could not achieve full-scale operations rapidly enough to compete in the near term with the resources of larger foreign manufacturers. This competitive challenge was exacerbated by a global oversupply of solar panels and a severe compression of prices that in part resulted from uncertainty in governmental incentive programs in Europe and the decline in credit markets that finance solar systems. Customers who have implemented Solyndra solutions can be assured that their systems will generate economical, clean, solar power for decades. Contact: Dave Miller, Director Corporate Communications (510) 440-2979. Solargate: Update – Solyndra to Lay off 1,100 and file Chapter 11 Bankruptcy. Just heard on KCBS, San Francisco, California. 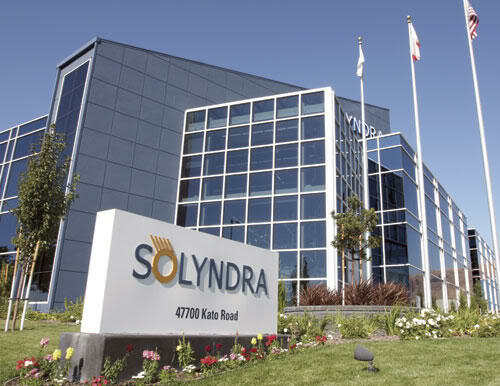 Solyndra to lay off 1,100 workers and file Chapter 11 Bankruptcy. “Solyndra LLC, the American manufacturer of innovative cylindrical solar systems for commercial rooftops today announced that global economic and solar industry market conditions have forced the Company to suspend its manufacturing operations,” the company said in a statement. So, back to that $534 million federal loan guarantee. Will the taxpayers get stiffed? Will anyone be prosecuted?0 Remember, the ex-CEO is a Obama buddy, so I wouldn’t hold my breath waiting for any action. I’d call this another Obama downgrade and another green jobs fail for Governor Jerry Brown, ex-Governor Schwarzenegger and the state of California. Solargate: How much longer will Solyndra (and others) be around? I’ve ragged about Solyndra before. There’s weird stuff going on with this company who even after obtaining a $535 million government loan guarantee and venture capital funds has suffered the inability to go public. They had to lay off employees and shut down one facility immediately after California’s Prop 25 initiative failed (the one that would have neutered California’s global warming law AB32). They’re now being investigated by Congress (House Energy and Commerce Committee) and their CEO recently bailed out. All in all it doesn’t appear to be a pretty picture for Solyndra, California, or their green jobs poster boy Governor Jerry Brown. Solar stocks have been a terrible investment over the past few years. Some of the big public names have been hammered. That is an absolute complete disaster. This is a low margin business to begin with. At Solyndra they were losing 84 cents for every dollar of sales. Based on that and the rest of what’s in this article about Solyndra, one has to wonder how much longer they’ll be in business. Will they do what Evergreen Solar did and move their operations to China and then file bankruptcy to get out of their massive debt in the United States? Or, will some other state offer them greener pastures like these two companies, who couldn’t get away from California’s high taxes, business stifling regulations, congestion, high housing and labor costs fast enough. Sooner or later reality has to hit the people who think solar and wind provide magic free electricity. Until then it’s more CO2 Insanity.